Today is the first official day of bread baking season at my house, if I had a sign that said ‘bread baking season open’ I would hang it over my stove. I have a long list of breads I want to make over the next few months so today I’m kicking off my season with a poached pear and ginger quick bread. I’ll start with this easy recipe that could also be baked with pureed ripe pears as a substitute for the poached pears. There are several things I like about this quick bread recipe. First of all I like using up the rest of my poached pears from last week’s pear tart. I also like that this quick bread recipe fits in a cute vintage bread pan I have, but most of all I like the flavor of poached pears with ginger. The markets are filled with fresh local pears and they are wonderful poached and baked in bread. 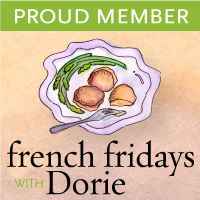 I’m off to enjoy the warm days of our Indian Summer and I hope everyone else is doing the same, I’ll be back on Friday with a recipe From Around My French Table for French Fridays with Dorie. Note on the pear puree: I pureed the poached pears ( about 3 pear halves) in a food processor. In a small bowl whisk together the flour, ground ginger, baking soda, baking powder and salt, set aside. In the bowl of a stand mixer cream together the sugar and butter, then add the egg and beat until smooth. Add the pear puree and vanilla. Add the flour mixture, beat until smooth. Stir in the candied ginger and walnuts. Spoon the batter into a greased 8 1/2" x 4 1/2" pan. Bake for 55-60 minutes or until toothpick inserted into bread comes away clean. Cool on a metal rack for 20 minutes, remove bread from the pan and continue to cool completely before slicing. I love that you have a bread baking season and agree you should have a sign or maybe a party to kick it off officially. Love pears and in quick bread to pies they are fantastic. Thanks for the recipe we have lots of great pears here in Arkansas. Yay for bread baking season!! 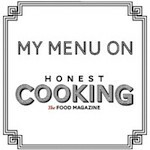 Can’t wait for you to share all your delicious recipes :). What a great bread to start with, I love the poached pears here! One of the reasons I love winter.. especially here in India….is that with lower temps.. we can bake .. cakes, breads, hot puddings…the list is endless!!! love love love this pear and ginger cake.. so winter!!! How gorgeous! Patty, this is one perfect autumn afternoon tea accompaniment. I love this time of year, and baking bread is one of the best parts! I love this version, pears and ginger sound so good together! I really like pears and ginger together, too. What is it about the combination? I’ve never combined them in a quick bread, though, and I really like the idea. Inspired recipe, Patty. he he I saw one a “Baking season” sign and found it funny since I bake year round. Let the bread baking begin! Can’t wait to see all your yummy creations! If this is a sign of things to come (yummy poached pear bread…), then I am excited! Patty – love that you have an “official bread baking” sign out. Smile. This bread looks and sounds amazing! Such a perfect Fall bread. Need to make this . Pinning now. Hope your week is going well! Wow, poached pear and ginger bread – that’s something we can only eat at home and we cannot buy. I love the combination. Lately either I pay more attention or not, ginger is being used a lot in baked goods (or maybe related to fall?). I can almost imagine the flavor of the bread.. hmm yum! Hi Patty! Somehow, my email subscription disappeared and I’m so sorry I’ve missed so many wonderful posts! I’ve just resubscribed. The two pear recipes, including this quick bread have really caught my eyes! I’ll be staying a bit to browse and see what I’ve missed. Patty, So sorry for my absence in commenting…we have had a chaotic few weeks! This pear bread looks amazing…so moist and perfect for fall! Lovely! Hi Patty, I’m in the process of making this loaf. There appears to be an error. The 1/4 tsp ginger does not translate into 3 oz. Did you mean 1/4 cup? Yes 1/4 cup! Sorry for the mistake.